produce something on the same lines, with the results shown on the two plates in this chapter. 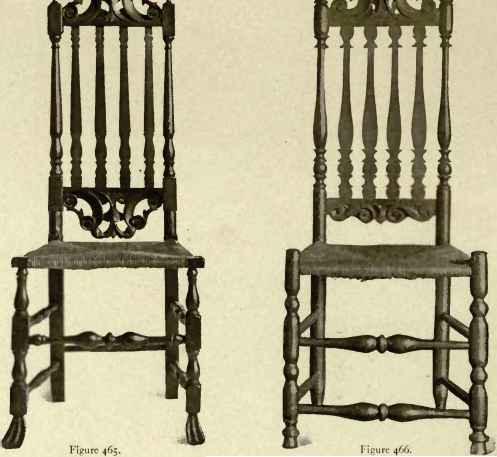 Of the examples here illustrated, all that I need say is that they are not such as would be likely ever to appeal very strongly to English tastes ; that the chairs are flimsy in appearance, and suitable only for production in cane or bamboo; and, finally, that all seem to indicate that the designer responsible for them was not blessed with an extensive knowledge of the technicalities of either cabinet-construction or chair making. It only remains to state here that a noted English designer, Thomas Chippendale, became greatly interested in Chambers's " Chinese" extravagances, studied them, and came to the conclusion that, in the proper hands, something might be done in that direction. By its admission to the homes of royalty a certain demand seemed to have been created for such work. Chippendale consequently took them in hand ; and what he made of them is fully demonstrated in my next chapter. This is my plea of justification for the inclusion in these pages of a note of Sir William Chambers's 11 Chinese " efforts. We have now arrived at that period in the history of the art and craft of cabinet designing and making when the names of leading members of their profession and trade became household words—for very often one man was proud to cultivate both, not deeming it beneath his dignity to stand at the bench and acquire a mastery over the tools and materials by which his ideas were to be carried out. I am inclined to think, nay, I am perfectly certain, that in this intimate practical knowledge, gained by actual experience, of the technicalities of the craft, is to be found the great secret of most of the success attained by the more prominent cabinet designers of the eighteenth century. Were such a state of things more prevalent to-day it would be far better for all concerned, but it is, unfortunately, the exception rather than the rule. There are several reasons for this falling-off, if I may so describe it. Let us briefly consider one or two of them.